A fragrance of the heart, Coach Love is all that is modern, desirable and chic. Soft, dewy petals and lush, fresh greens romance sensual woods, luscious caramel and warm skin musk for a scent as unforgettable as the moment you fall in love. 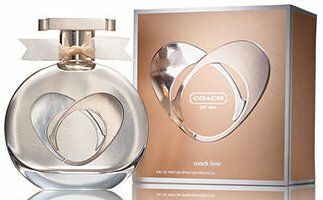 Coach Love is available now at Macy's, in 50 ml Eau de Parfum, $72. Update: Coach Love is a floral fragrance; notes include mandarin, dewberry, green violet, freesia, magnolia, jasmine, gardenia, sandalwood, patchouli, vanilla, caramel and musk. It will also be sold in 30 and 100 ml. My! Sounds Lovely… and the Bottle is GORGEOUS!!!!!!!!! Bottle is pretty alright but greens+caramel+musk..no thanks. Coach “C”s, can’t have too many of those it seems, lol. Went to a Coach Outlet store once..hubs said all of the stuff was ugly..for the most part..I’d have to agree, lol. He also said..’how brilliant of marketing! Just charge and arm and a leg for a purse and put Cs on it.’ lol. I got to admit, some of the hats, scarves..just had those Cs..and were ugly! No thanks! I have to agree about much of the newer Coach stuff. I have several purses (the newest being about 10 years old) and they were classic made with beautiful leather and the only logo around was the leather keychain hanging on the purse strap with Coach printed on it. Each one also had a serial number embossed on the isnide. When I scratchted the leather of one purse and asked them for instructions on how to minimize the scratch, they sent me a new purse. Wow! I wish I would encounter such type of customer service that goes beyond what is expected. I guess its clever, just, for some reason it looks squat to me. I swear I could devise a frosted glass circle with a heart of two Cs that I *would* like — this just isn’t it!